The Department of Sociology will be organizing the monthly seminar for the month of November, on Thursday 15th November 2018 from 2.00 p.m – 4.00 p.m in the Seminar Room of the Department of Sociology. At this seminar, Mr. M. G. L. Mahesh Premarathna will be speaking on “New forms of Buddhism and the social formation in postwar Sri Lanka”, and Mr. K. Krishnaraj will be speaking on “ Social formation and Goddess Kannagi worship in Sri Lanka” . Both speakers, Mr. M. G. L. Mahesh Premarathna and Mr. K. Krishnaraj are Ph.D. 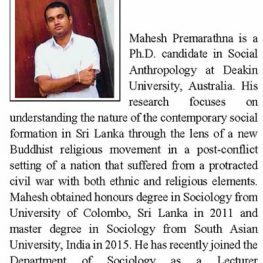 Candidates in Social Anthropology at Deakin University, Australia.